ROBO 3D R1 Plus brings the world of 3D Printing down to earth. Whether you are looking to own one in the home/office or for DIY projects, prototyping, and concept actualization, you now have what you need. What’s more, it does the job those more expensive units that only up until now were able to accomplish. 3D Printing is becoming the hottest way to take what is in your mind and turn those thoughts & images into reality. You can now create actual objects in a way that is simple and mimics the printing of a common page of text. You can create with the colors of the rainbow as well as a plethora of materials. Here is where the ROBO R1 plus really shines as it can give you 100-micron accuracy in the final output. This puts the R1 Plus on the level of its other contenders that cost thousands more. This makes it ideal for the prototyping of new products, as this allows you to create precision parts to build full-scale models of the finished object that are precise and professional looking and don’t look ragged around the edges. This product gives you one of the largest build volumes available for a personal/home/office purpose at 10 x 9 x 8 inches that provide you with a whopping 720 cubic inches of usable space to fabricate with. This is 2 times what other contenders are capable of doing. This means you don’t have to restrict yourself to creating tiny models and can create larger and thus more detailed replicas of your concept’s design and final form. This combining the precision and volume of size take the ROBO R1 Plus into a new level of 3D Printing. The unit is compact and weighs in at only 28 pounds. It’s 20 X 18 X 21 inches physical dimensions let it be placed virtually anywhere in your work area or on a desktop near your workstation for convenience. With the ROBO R1 Plus, you are only limited by your imagination. 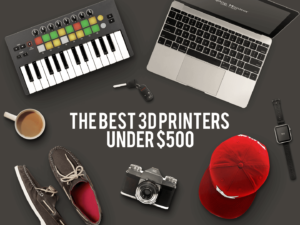 All else is done for you making it one of the best deals on 3D printing available today. This unit has a wide variety of accessories. It is compact and can fit anywhere. This unit comes with Heated Bed means perfectly shaped output with no uneven edges. The output from this product is clean and precise. A wide variety of materials to fabricate from using this device and a large print volume that lets you build real sized replicas or finished products. Initial set up is tricky in the beginning.However, videos and seller’s support will walk you through any issues. Tech support is ramping up to support this product. But they are willing to get the resources needed to help you succeed in your projects and goals. Users report setup and cleaning problems. (Which are not typical for this unit) ROBO TS offers complete replacement and aid. Overall, the majority of the owner/user community enthusiastic supporters of this product in their reviews. However, there have been few cases of damaged machines as well as those who wouldn’t make the effort to resolve issues. So, when this is all factored in this unit comes in at 4.0 of 5 stars. This reviewer who digs much deeper and does comparisons across the 3D printing industry rates the unit at a 4.3 out of 5. Future units need to be simplified to cater to those who want one button operation. This is where the product beats the pack as it comes in at around $800. Comparable units come in at closer to the $1000 and up range and others don’t have the quality or versatility of the R1 Plus. 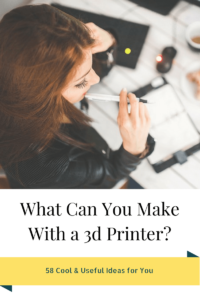 You now can take 3D printing out of the lab and bring it home to help you realize your design and entrepreneurial goals. If you are a hobbyist or DIYer you can create one of a kind craft projects or do home remodeling and renovation.